In this article, we take a closer look at three of Oral-B’s top-of-line smart brushes: the Oral-B 5000 vs Oral-B 6000 vs Oral-B 7000, and analyze their pros and cons. All of these brushes are Bluetooth-compatible and have Smartphone accessibility. 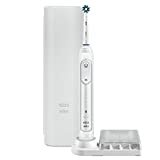 Check Electric Toothbrush Deals 2019. Oral-B 5000 originally comes with a FlossAction brush-head. The 7000 model on providing specialized tooth by tooth cleaning mode operation. The Oral-B 7000 comes packed with three brush-heads in its case: a CrossAction brush-head, a ProWhite brush-head, and a Sensitive Clean brush-head. Each of these brushes is designed to give your mouth the perfect clean. Their handles transmit data to your phone via Bluetooth to provide the user with a summarized and easily comprehensible information which covers a very wide range information. However, these brushes have their own areas of individual focus. Oral-B 5000 specializes in removing plaque stored near the gums, Oral-B 6000 stresses teeth whitening while the Oral-B 7000 gives the user tooth by tooth clean. Considering their costs, the Oral-B 7000 is definitely the most feature-rich brush handle of all the three, providing more options for a thorough mouth clean in comparison to others. The handle designs of these brushes are quite similar but with few noticeable exceptions. Each brush has a power button on the faceplate along with an arrow key to change the brushing modes according to requirements. Oral-B 5000, unlike Oral-B 6000 and 7000 models does not have a 360-degree ring around its handle which works as a sensor and lightens up if the user is pressing the handle too hard. READ Oral B 7500 vs Oral B 7000 Review : Features, Pros, and Cons of Each Electric Toothbrush Model. Though each brush handle comes with their unique rubber grip, it has to be pointed out that the rubber grip on Oral-B 7000 feels far better and its anti-skid design works better than its counterparts. Apart from differences in design, these brushes somewhat differ in the functionality they provide to their respective users. The deep clean mode which offers an intense brushing experience. As already mentioned, each of these brushes has its unique areas of focus. Oral-B 5000 puts an emphasis on plaque removal, the 6000 model on teeth whitening and the 7000 model on providing specialized tooth by tooth cleaning mode operation. Each of the variants has its own method of operation. Oral-B 5000 achieves its goals by the vibrations, pulsations and oscillations of its brush head whereas the 6000 model has a round shaped head which moves and works in that pattern. Each of these brushes comes with a brush stand as well as a rigid and durable traveling case which has room for different kinds of brush heads. It can also act as a smartphone holder. Oral-B 7000 comes with a bonus feature of charging station which would enable users to charge their brush and phone simultaneously, thus making them very useful in case of travel. 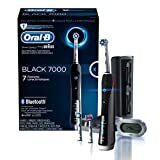 Another unique feature of Oral-B 7000 is its Smart Guide’. It is a digital reader which provides the user with real-time feedback. It shows things like a timer, present brushing mode so that users don’t have to look at their smartphone all the time and a few other useful references. The 5 brushing modes (6 in case of Oral-B 7000) provide the user with a wide range of settings to choose from. These many modes are certainly a deluxe feature present only in these brushes, which makes them a unique choice in the electric brush segment. Bluetooth capabilities of these handles is an attractive feature for someone looking to revitalize their brushing experience. The mobile app is very intuitive and the feedback it provides can alter the way you brush your teeth. 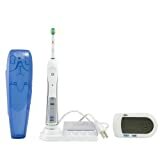 It records various data points and utilizes them in providing you with customized brushing instructions. All of these brushes come with pressure sensors. While not explicitly essential, these sensors make sure that users do not put more than required amount of force on their gums and teeth. They help in avoiding enamel damage and thus, are very useful for children. These brushes are customized with timers which make sure that you do not spend more time brushing one region of your mouth than other. The pacer feature equipped on this helps to train you with the right way to brush the teeth. The brush, however, does not shut down after 2 minutes which is the recommended time. However, it does alert the user via the app of the time spent. It makes sure each area of the mouth gets the maximum amount of care. Oral-B 5000 originally comes with a FlossAction brush-head. The Oral-B 6000 features a CrossAction brush-head, and Oral-B 7000 comes packed with three brush-heads in its case: a CrossAction brush-head, a ProWhite brush-head, and a Sensitive Clean brush-head. However, each brush is compatible with following Oral-B electric-toothbrush heads: Deep Sweep, 3D White, CrossAction, Floss Action, Dual Clean, Sensitive, Precision Clean, Power Tip, and Ortho. All these give you a wide range of options. Some people might have an issue with battery life as it is slightly lower in comparison to Oral-B’s previous models. Oral-B 5000, 6000 and 7000 come with a rechargeable Lithium-Ion battery which can last up to 10, 12 and 10 days of normal uses respectively. But considering their vast features, it is no surprise. All of these brushes are high-end products so obviously, their prices would be higher compared to any other models in the market. The hefty price can make someone nervous but be assured, the different functionality of the brush is worthy of its high price tag. After considering various aspects of the Oral-B Pro 5000 VS 6000 VS 7000, it has to be mentioned that any brush is not limited to a specific niche of users. Their tooth cleaning and whitening as well gum caring capabilities are remarkable, thus, making them an efficient oral hygiene product. You can decide which of the features suits you the most, and according to your needs and budget, you can pick out the perfect model for yourself. Rest assured, you cannot go wrong in making a choice since each brush is well adept at providing you with the best tooth care you can ever experience.